Ani Villas - Amber is a beachfront resort property that doesn’t skimp on luxury. There’s not one, but two pools, and one has a water slide. The villa has a private beach, a full staff, and four absolutely stunning Master Suites. Speaking of the full staff, there’s a 24-hour butler to wait on you hand and foot and a private chef to prepare every meal. If you want an all-inclusive experience, this villa is a great choice. 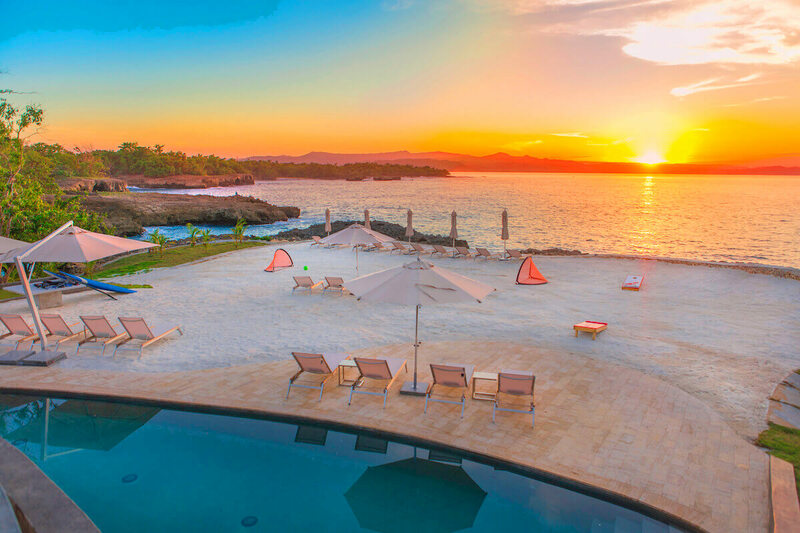 Ani Villa - Amber is a luxurious 6-bedroom villa on a private peninsula near Playa Caleton. The villa enjoys stunning wraparound views of the sea, sand, and mountains, plus it’s in an all-inclusive resort. Amber faces the sea and has two infinity pools with a water slide. There’s a private sandy area for sunbathing, lounging, and al fresco dining. Guests have full access to the exclusive tennis court, gym, and spa to stay blissed out and in shape. In fact, guests can enjoy complimentary, daily spa treatments and be doted on by the estate’s 24-hour butler. On top of the five-star amenities, the property comes staffed with a personal chef, so guests can feast on gourmet meals and snacks every day from the professional-grade kitchen. Amber blends island living with contemporary style to create a unique luxury experience. Every room opens to the sea via sliding glass doors and has high cathedral ceilings. The living and dining pavilions are mostly open-air, and there’s plenty of entertainment from the billiards table, to the wet bar, to the media room. Villa Amber has four bedrooms and two independent Master Suites, each of which has an ensuite bathroom. Amber’s upper level holds two Master Suites with balconies overlooking the turquoise sea. On the lower level, there’s one Master Suite and two guest suites that can be made up as king or twin bedrooms. The three lower level bedrooms surround the living room, and one of them has exterior access. Both of the independent Master Suites offer guests privacy without isolating them too much from the action of the main villas. All four of the Master Suites have a terrace, Apple TV with Netflix, and ensuite bathroom with an outdoor shower and large soaking tub. They’re designed with pitched ceilings and decorated with unique artwork displayed on onyx slabs. Ani Villas - Amber is located in a private region that’s a short walk or drive from the island’s gorgeous beaches, top-notch surfing/kite surfing, and Trent Jones clifftop golf course. This villa is ideal for a wedding, family reunion, or corporate retreat.